When asked to list the biggest risks to banks today, many cite cybersecurity issues and the growth of leveraged corporate lending. 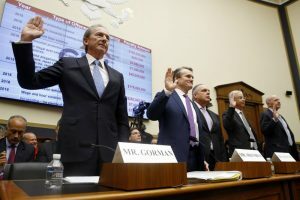 NEW YORK — The heads of seven of the largest banks in the U.S. fielded sometimes contentious questions from a House committee Wednesday, some dealing with current risks to the financial system and other focused on more politically-charged topics. The hearing had some policy questions, but many members of Congress took their time to ask politically-charged questions of the CEOs, on topics from gun regulations and executive compensation. Democrats took their time to laud Bank of America and Citigroup’s decision not to finance gun manufacturing companies, while Republicans took their turns to lambast them. Rep. Jim Himes, D-Connecticut, asked all CEOs what they considered to be the products or businesses most at risk in the banking system. No CEOs mentioned home mortgages – the product that caused the 2008 financial crisis – but instead the two dominant answers were cybersecurity risks and growth of leveraged corporate lending, or lending to companies with already large debtloads. Another threat mentioned was “shadow banks,” which is a term used to describe non-bank companies getting into financial products, particularly financial technology companies.